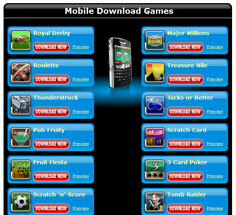 All Slots Mobile Casino lets users play the casino’s top mobile games on the go. From mobile blackjack to roulette, poker, to mobile slots, there are 21 great games to choose from, and they can be played on any WAP-enabled mobile telephone. 11 games are available for touch based devices like iPhone. 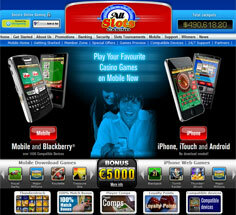 With strong bonuses and a great loyalty program, this mobile casino really has it all! Most mobile telephones purchased within the last few years will be capable of loading the Spin 3 software used by All Slots Mobile. To be sure, check your make and model against the list on the All Slots Mobile website – there are hundreds of supported phones, so there’s a good chance you can play! Loading the software just takes a couple of minutes. Games are added separately, letting players only download the titles they want to play. Game downloads only take about a minute, and games only need to be downloaded once. 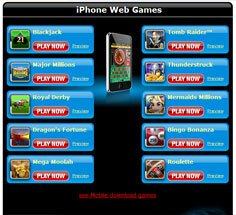 21 mobile casino games are available for download at All Slots Mobile Casino. 11 of these are available for touch based devices like the iPhone and iPad. This may not seem like much, but whoever chose them did a good job of picking titles that really represent the whole spectrum of casino games. There is a little of everything here – slots, video poker, roulette, keno, blackjack, and more. The games are bright and bold, and look great on any mobile. Four of them even offer large progressive mobile jackpots – imagine winning half a million while sitting on the bus! 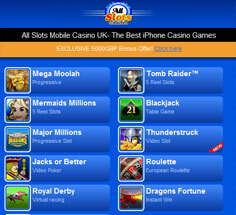 In July 2010, All Slots Mobile became the first mobile casino in the world to offer an exclusive iPad mobile casino. A special webpage has been set up for iPad users, offering 11 no-download mobile casino games that work perfectly with the iPad’s touch screen. Look for Mega Moolah and Tomb Raider slots, roulette, blackjack, and more. All Slots Mobile is extremely generous when it comes to bonuses. 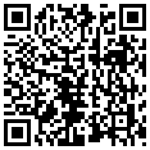 They start new players off with 5 free credits upon registration, and a $/€/£500 Welcome Package on the first 4 deposits. The casino also awards comps bonuses to top members, and a sturdy point-based loyalty program pays a little back with every wager made. There is a lot of bonus cash up for grabs at All Slot Mobile, so don’t miss out! The best feature of All Slots Mobile Casino is the bonus system, which can provide players with huge amounts of extra cash to play with. The games selection is also quite good, since it provides players with a little bit of every type of game, all in one place. Check your phone against the list, grab the software and a few games, and enjoy the freedom of mobile casinos today!